Dubai: Cycling enthusiasts in Dubai are in for a treat as projects to build new tracks across 11 locations in the city have been launched, the Roads and Transport Authority (RTA) has announced. 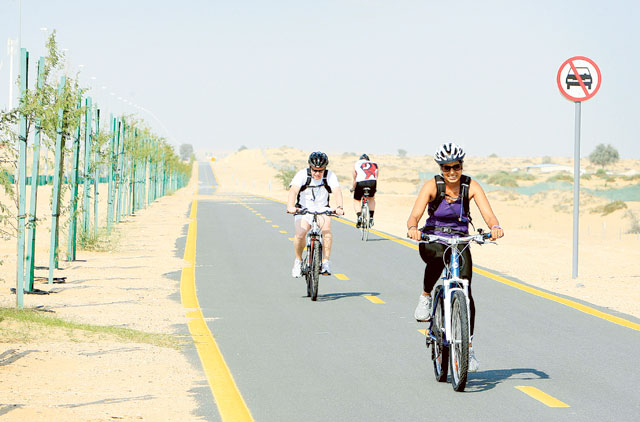 The announcement from RTA comes close on the heels of opening a 75-km long Dubai Cycling Course in Seih Assalam, part of a cycling master plan that includes a 25km track in Jumeirah as well as smaller tracks near Mall of the Emirates, Al Mamzar Park and Al Mizhar Park. Apart from these tracks, RTA is currently constructing a 4.5-km-long track in the central district of Bur Dubai, and has completed the designs of four tracks linking Jumeirah Road with four Metro stations on Shaikh Zayed Road. Additionally, the authority has completed the construction of 1,400 bike racks around all Metro stations. Following the successful implementation of the first phase of the cycling master plan, RTA has now approved construction of cycling tracks in 11 residential areas stretching 52km at a cost of Dh40 million. “The construction of the cycling tracks is part of a master plan developed by RTA to provide dedicated cycling spaces across the entire Dubai emirate in a bid to encourage the use of bikes as an environment-friendly transit means, as well as for the benefit of cycling enthusiasts,” said Mattar Al Tayer, Chairman of the Board and Executive Director of RTA. Work on the new cycling tracks will begin this year and will be completed by 2016. Residential areas like Al Barsha, Al Khawaneej, Al Warqa, Al Quoz, Al Safouh Road, Al Mamzar Park, Mushrif Park, Hor Al Anz East, and Mirdif, have been selected for the project. Al Tayer said the areas were selected based on various parameters including their popularity with tourists and their aesthetic nature. The areas are also frequented by cyclists and serve the Metro and public transport stations. “The design of the tracks has been tailored to ensure the security and safety of bikers and the locations have been selected keeping in mind the convenience of residents and visitors to the areas, suitability of the site, traffic safety, and the appeal to pedestrians,” added Al Tayer. Al Tayer said that since 2008 RTA has developed a Cycling Master Plan that included charting routes for bikes within the rights-of-way as well as separate lanes. The Plan detailed the specifications and standards of separating cycling tracks from pedestrian pathways, and addressed the intersection points with cycling tracks, provision of biking racks in general and at the public transport stations in particular, cycling lanes in entertainment areas, materials to be used in the construction of cycling tracks, and signage for bikes and tracks. So far the biggest of the cycling projects constructed by the RTA has been the 75-km-long Dubai Cycling Course. The first part of this course stretching 18km alongside Al Qudra Road North was opened in January. The second part of the course, which was opened in March, stretches about 49km, starting from the front of Bab Al Shams Hotel up to Al Qudra Road roundabout, then turns southward alongside the road leading to Seih Assalam. The course includes public utilities and shops for hiring bikes, gear and accessories in addition to a medical clinic.